Decades after its arrival as an office tool, email is still very much the workhorse of the working world. But while you're probably used to leaving everything lurking in the inbox somewhere, at some stage you will have to export some of that data into another format for the purposes of archiving. 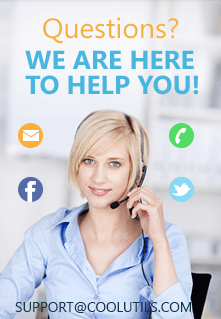 That's where you'll find yourself needing a PST converter to do the heavy lifting and, ideally, one that can handle bulk operations to save yourself some time. Step forward Total Outlook Converter Pro - a fully featured PST converter that can handle both OST and PST files. 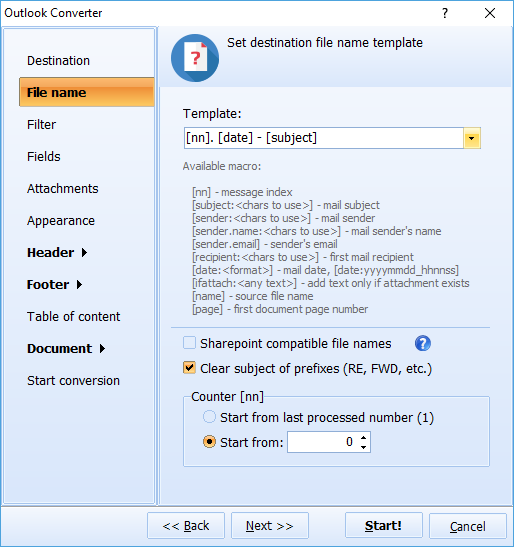 Its batch processing functionality will let you blast through tasks such as PST to TIFF conversion and you'll benefit from advanced features such as being able to combine multiple emails into one TIFF file, setting compression modes and being able to add headers and footers of your choosing to the output files - ideal for tasks such as Bates stamping. 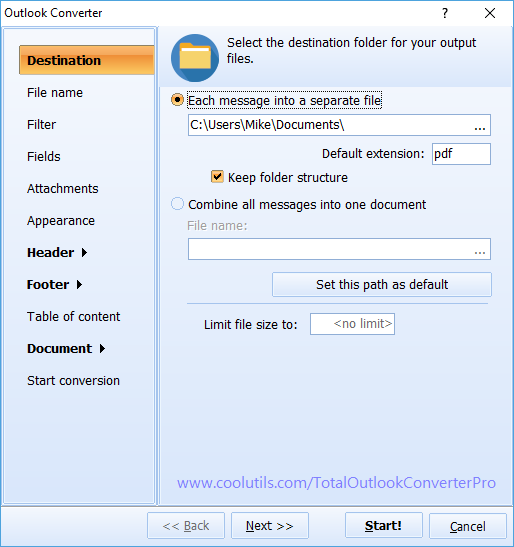 Total Outlook Converter Pro can handle emails from multiple time zones and also gives you the option of excluding defined fields when converting to trim your data. Where it really stands out however is in dealing with email attachments. In addition to being able to extract attachments from emails, Total Outlook Converter Pro lets you convert the attachments to an output format of your choice as it processes them. Supported output formats include PDF, HTML, DOC, TIFF and many more. It's a piece of functionality none of our competitors can match and a huge timesaver when you're looking to convert PST to TIFF with attachments. Finding your files to convert is a piece of cake as well. 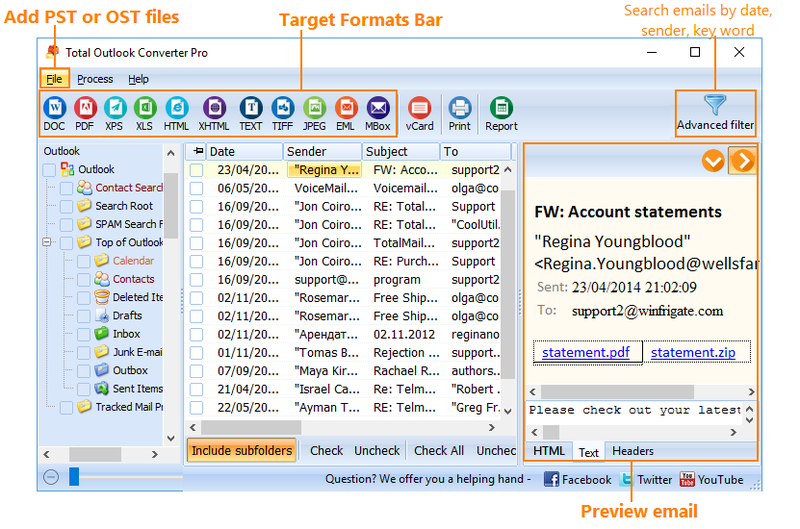 The software includes a powerful Find Outlook Files option that makes finding stray emails straightforward. We've included a range of licensing options for Total Outlook Converter Pro covering everything from personal use up to embedding it in other applications with ActiveX in our server version. We've been producing market-leading conversion software for thousands of happy customers across the world for over a decade now and we're happy to let our product convince you of its merits by itself. Download a thirty day, fully operational, free copy of our software today and start discovering the productivity boost it can give you and your team!